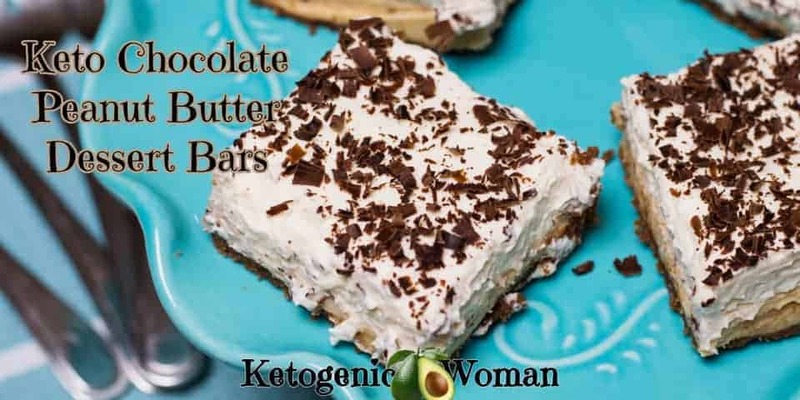 I am always up for any keto dessert bar that combines chocolate and peanut butter! There is a reason that Chocolate Peanut cups are always at or near the top of the list of best selling candy bars in North America. I am definitely into that trend! But if you are having company or need to take something to the church potluck, you can’t exactly just break out the candy bars. This recipe takes this favorite flavor combo and elevates it into an attractive dessert bar, only with a much lighter more cheesecake like texture. 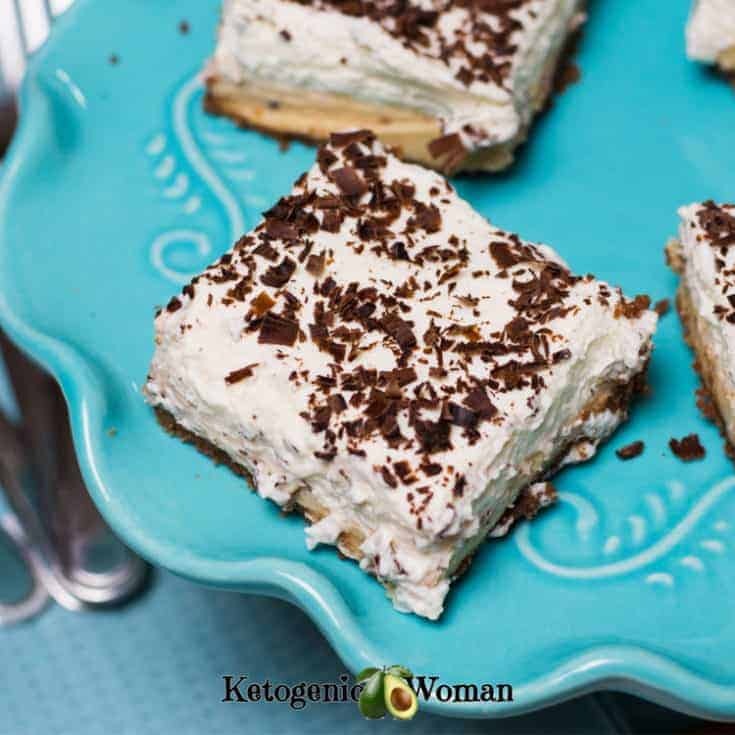 As a bonus this is a no bake keto dessert, my very favorite kind always! Is Peanut Butter a Ketogenic Food? I thought I’d get this out of the way right off the bat. Technically, peanuts are legumes and many keto purists do avoid peanuts, and therefore avoid peanut butter. The other reason is that peanuts can be a severe allergen and for that reason many people both keto and non keto alike, tend to avoid them. But if you are not a purist (and I am definitely NOT!) and nobody in your family is allergic to peanuts, we can certainly work with peanut butter. The macros for 1 tbsp peanut butter are: Fat 8g, Protein 4g, Carbs 2g, making peanut butter a very keto friendly food! For one portion of this dessert you are consuming 1 teaspoon of peanut butter. I can live with that! Use a peanut butter that has only peanuts as the ingredient, or peanuts and salt. Note: The blue links will lead you to a place where you can purchase items and ingredients that I recommend. If you purchase, I do make a small commission at no cost to you, which helps keep this site running. I appreciate your support! A food processor helps to make the crust very fast. I have made it with just a bowl and wooden spoon so don’t fret if you don’t have one! A 9 x 13 inch pan. I have a few of these exact pans here, they are so versatile for many recipes. Use a non sugar smooth peanut butter. I used the new Kraft Peanuts Only, which is readily available where I live. This Teddies All Natural is the highest rated on Amazon. Almond flour. If you’ve done any keto baking you likely already have this in your pantry. Dark chocolate bar (1 square). A bar is easy to grate to make nice curls of chocolate. Lily’s bars or Lindt 85-90% dark are readily available. Use powdered or confectioner’s sweetener as the granulated tastes fine but stays crunchy in your baking! If you use a teaspoon of Stevia with your erythritol, it seems to cut out the cooling effect that some people taste. If you are serving this dish the same day, no stabilizer is needed for the whipped cream layer. But if this is going to be around for a couple days you will need to use knox gelatin. The only other option would be to use sugar free Cool Whip but I just can’t do it. 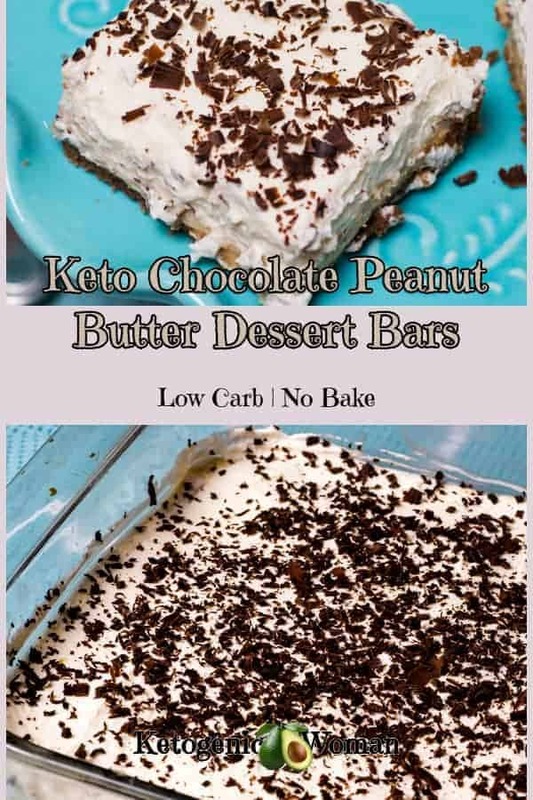 These no bake low carb dessert bars combine my 2 favorite food groups: peanut butter and chocolate! 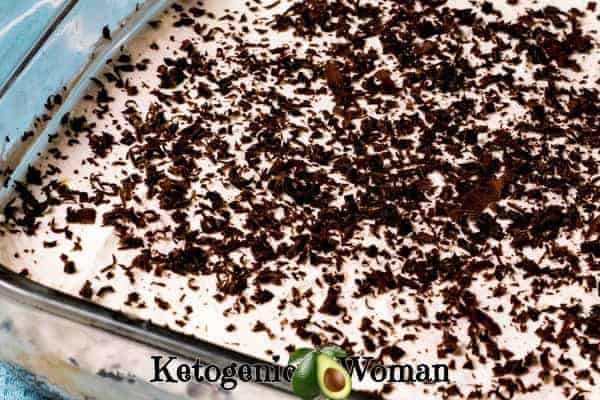 Perfect keto treat for a potluck or party! Combine the crust ingredients in a food processor with S-blade and process until ingredients stick together. I have also just done this in a bowl in case you don't have a food processor. Press the dough into the bottom of a 9 x 13 glass pan. Keep in the fridge while you make the other layers. If you are keeping these bars in the fridge for a few days, then you will need a stabilizer. Sprinkle 1 packet of Knox gelatin over 3 tbsp water in a pot. Heat over low and stir until crystals dissolve. Set aside to cool. If using the stabilizer, add it now and whip again for a few more seconds. Spread the cream layer evenly over the peanut butter layer with a spatula. Using a grater, grate a piece of dark chocolate over top the entire pan. I used 1 square of Lindt 90% chocolate. Tagged chocolate, Low Carb Desserts. Bookmark the permalink. These look totally delicious. I can’t wait to try out the recipe. You totally should, it’s one of my favorites!